So, let's start comparing these hand creams. First up, Clarins Hand and Nail Treatment Cream, which isn't deliciously scented by any means, but I guess that's a good thing — you don't get sick of it! I'd recommend this for sensitive, dry or mature skins. It forms a protective barrier around the skin, but absorbs quickly and doesn't feel greasy. With an added benefit of protecting against spots. I chose a pack with 3 mini sizes (30ml each), to take up less space in my beauty bag. Well, I just love minis. This cream really delivers a good dose of nourishment to the cuticles, thanks to the sesame oil in the formula and the packaging fits into a more sophisticated category. The next product really surprised me, in a good way. After I finished my Soap & Glory Hand Food (review here), I thought no other hand cream could match it's level of performance. 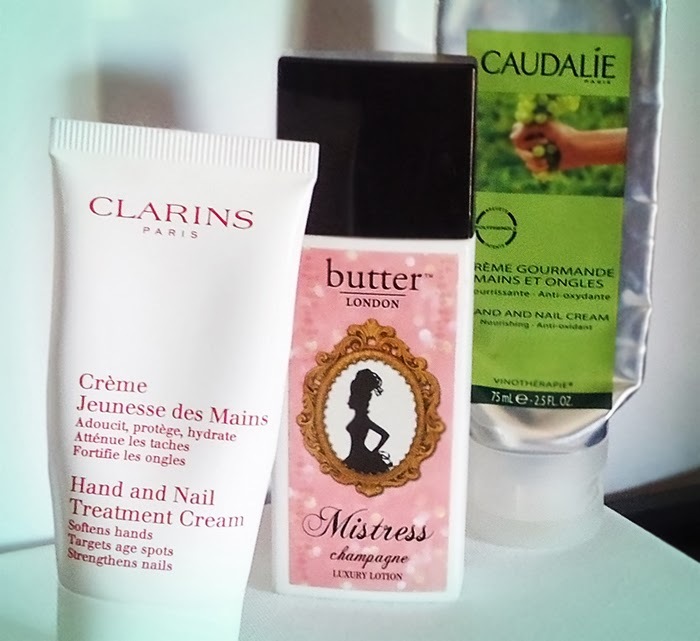 Or fragrance... Until I purchased Caudalie Hand & Nail Cream, by chance, because I had forgetten to bring a hand cream. Madness! To start off, the scent is absolutely delicious. I was expecting it to be similar to Beauty Elixir, but it actually has a sweet orange scent. And I'm usually not a fan of fruity scents in beauty products, but this is gorgeous. Besides it's anti-oxidant properties, it makes my hands feel protected — ideal when the skin feels really dry and tight, due to exposure to AC or more extreme weather conditions. The formula with grape seed polyphenols, shea butter, grape oil and avocado extract (besides the obvious, sweet orange), has the perfect texture — not too thick nor too fluid — and absorbs rapidly. Truly softens the cuticles and its nourishing power lasts for a long time. Plus, being a Caudalie product, it has no parabens, mineral oils and so forth. To finish this category, I chose a product that was sitting in my drawer for ages, waiting to be used. In fact, I think it's been discontinued... But I was able to find it in Harvey Nichols, here. Butter London Mistress Luxury Lotion, a very fluid lotion with a champagne fragrance, which is supposed to be very subtle, like a mistress. Well, I don't think it's that subtle. It's kind of an old-school "grandma" scent — you either like it or you really don't. The packaging is very pretty, as are all Butter London products, with a vintage feel and very feminine colours. The formula contains vitamins A, C, and E, chamomile and lemon balm. It is vegan and paraben free. Being very fluid, feels like you're pouring foundation on the back of your hand and gets used up far more quickly. Absorbs almost immediately and it's not the most nourishing formula, but feels nice and hydrating upon application. I tend to use it very often so it ran out pretty fast.